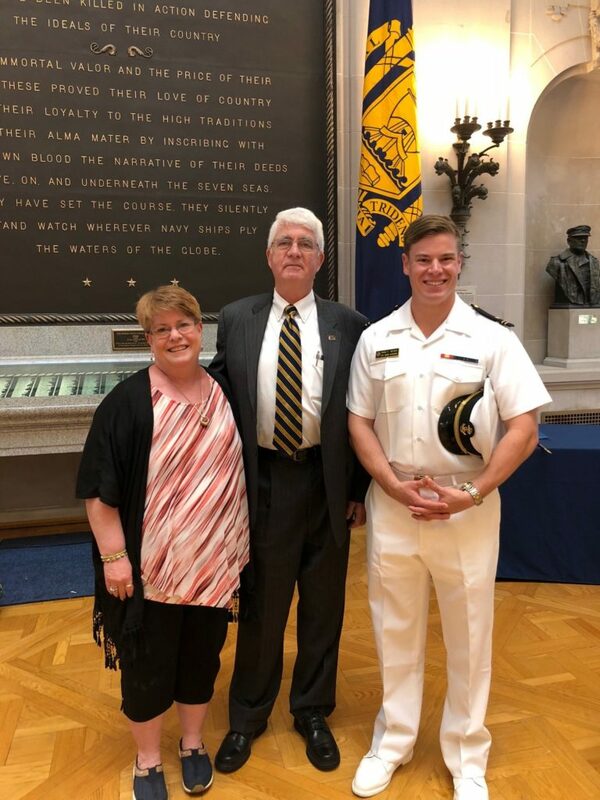 Midshipman First Class Ryan Menke of Wichita, KS, receiving the NHF Captain Edward L. Beach, Jr. Naval/Military History Award from former NHF executive director Captain Todd Creekman (USNA Class of 1969) and U.S. 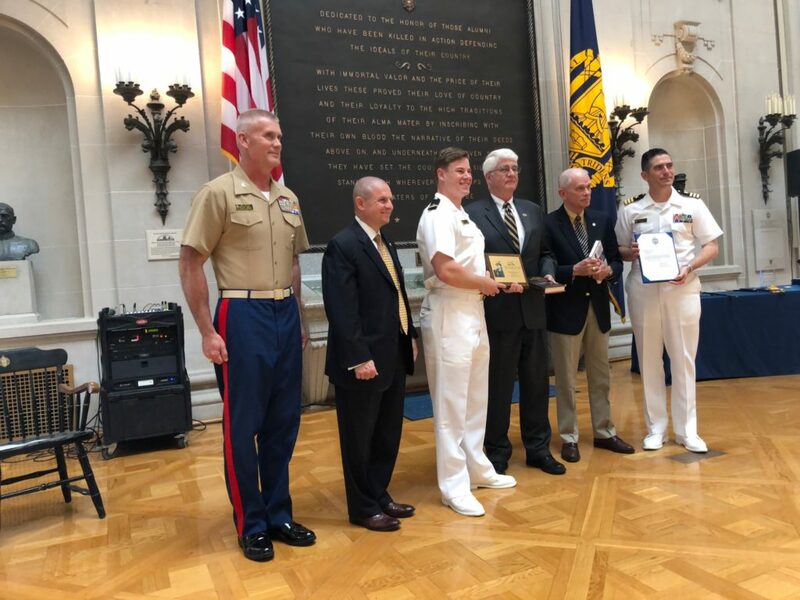 Naval Institute’s LCDR Tom Cutler (Gordon England Chair of Professional Naval Literature at USNI) at the May 23, 2018 Prizes and Awards Ceremony of the U.S. Naval Academy’s Division of Humanities and Social Sciences. Midshipman Menke’s proud mother Rhonda and younger brother Alex witnessed the event. (Others pictured are Division Director Colonel Jon Aytes, USMC; USNA Academic Dean & Provost Dr. Andrew T. Phillips; and History Department Chair Commander Mark Belson, USN). 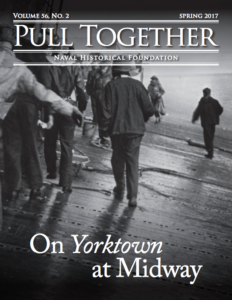 Midshipman Ryan is a History Department Honors graduate who will be commissioned an Ensign in the Navy at his graduation ceremony this Friday, May 25th. 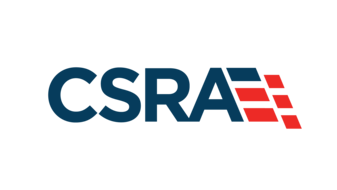 This fall he will attend nuclear power school and go on to nuclear submarine duty, following in the footsteps of his late father, Commander Kurt W. Menke, USNA Class of 1985 and the award’s namesake, Captain Ned Beach, USNA Class of 1939. Ned Beach, a longtime NHF Board Member, was a decorated World War II submariner, commanding officer of USS Triton (SSRN-586), which in 1960 was the first vessel to complete a submerged circumnavigation of the earth. Beach was the author of the best-selling “Run Silent, Run Deep,” a copy of which was presented to Midshipman Menke along with an awards plaque.